- that of the supporting flange as given by formula (6.20) in 6.2.6.4.3(1) calculated assuming the applied force is concentrated over an effective width, beff, of the flange as given in 4.10(2) or 4.10(4) as relevant." /yf is the yield strength of the flange of the I or H section; fyp is the yield strength of the plate welded to the I or H section. fup is the ultimate strength of the plate welded to the I or H section. bp is the width of the plate welded to the I or H section. Otherwise the joint should be stiffened. NOTE: For hollow sections, see Table 7.13. (5) Even if beff < bp, the welds connecting the plate to the flange need to be designed to transmit the design resistance of the plate bp !\>f[ \> / 7mo assuming a uniform stress distribution. (1) In lap joints the design resistance of a fillet weld should be reduced by multiplying it by a reduction factor /?LW to allow for the effects of non-uniform distribution of stress along its length. (2) The provisions given in 4.11 do not apply when the stress distribution along the weld corresponds to the stress distribution in the adjacent base metal, as, for example, in the case of a weld connecting the flange and the web of a plate girder. Lj is the overall length of the lap in the direction of the force transfer. Lw is the length of the weld (in metres). (1) Local eccentricity should be avoided whenever it is possible. 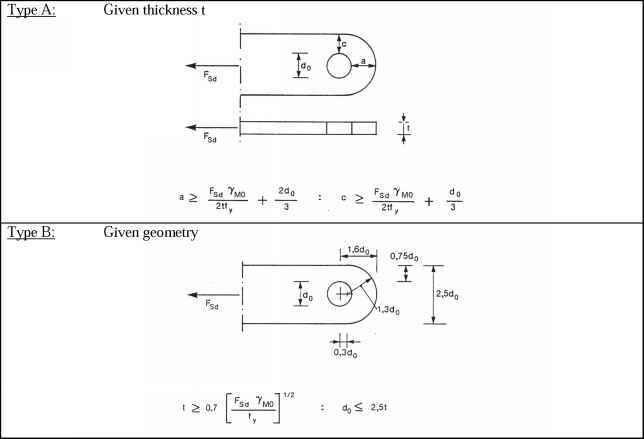 - Where a tensile force transmitted perpendicular to the longitudinal axis of the weld produces a bending moment, resulting in a tension force at the root of the weld, see Figure 4.9(b). (3) Local eccentricity need not be taken into account if a weld is used as part of a weld group around the perimeter of a structural hollow section. (1) In angles connected by one leg, the eccentricity of welded lap joint end connections may be allowed for by adopting an effective cross-sectional area and then treating the member as concentrically loaded. (2) For an equal-leg angle, or an unequal-leg angle connected by its larger leg, the effective area may be taken as equal to the gross area. (3) For an unequal-leg angle connected by its smaller leg, the effective area should be taken as equal to the gross cross-sectional area of an equivalent equal-leg angle of leg size equal to that of the smaller leg, when determining the design resistance of the cross-section, see EN 1993-1-1. However when determining the design buckling resistance of a compression member, see EN 1993-1-1, the actual gross cross-sectional area should be used. - the r/i-ratio satisfy the relevant value obtained from Table 4.2.